Wayne State University Press, 9780814344545, 184pp. 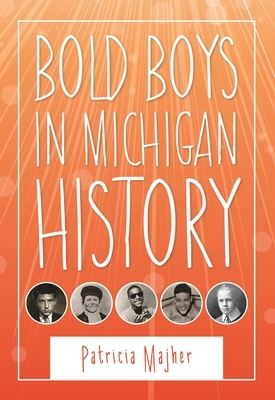 Bold Boys in Michigan History-a companion to Great Girls in Michigan History-explores the stories of twenty boys who did some amazing things before they turned twenty years old. Author Patricia Majher presents easy-to-read mini-biographies about both highly acclaimed and lesser-known Michiganders, all of whom have led remarkable lives that will intrigue and inspire. This collection offers a diverse group that represents different cultures, time periods, and parts of the state. Woven into each chapter are life lessons that will encourage young readers to nurture their own passions and stand up for their beliefs. Some boys came from humble beginnings, including boxing champion Joe Louis, who used his athletic ability to raise his family out of poverty. Furtrapper Charles Langlade and Potawatomi chief Simon Pokagon fought hard to preserve their culture in a predominantly white world. Scientist Thomas Edison, Major League Baseball player Jim Abbott, and singer-songwriter Stevie Wonder excelled despite having physical disabilities. Some of the boys went on to become men who achieved great things in their chosen area of expertise. Success can come at any age, though, and can serve as motivation to those looking to be inspired. There are many books that celebrate great Michigan men, but very little has been written about accomplished young men. Bold Boys in Michigan History includes photographs, additional reading lists, and suggested places to visit around Michigan. Words that may be unfamiliar to some readers are highlighted in the text and defined in a glossary. Readers between the ages of 8 and 12 will love getting wrapped up in the stories of boys their own age who have lived extraordinary lives. Patricia Majher is a former editor of Michigan History magazine and a museum professional who has held positions at institutions including The Henry Ford and Mackinac State Historic Parks. Her previous books include Ladies of the Lights: Michigan Women in the U.S. Lighthouse Service and Great Girls in Michigan History (Wayne State University Press, 2015).